To view 2 more pictures, interactive maps and the full, detailed description of the Middle Oaks Estates community, please Login. Building a new home in Middle Oaks Estates can yield a stunning residence. A new home built by a custom home builder can bring dreams to life. Tucked away in a serene patch of land in Chesapeake, VA, this development offers both city and country amenities. City dwellers can rest easy knowing their commute to military bases like NAS Oceana and Dam Neck will not be bad. Those who prefer a life less complicated can enjoy the lack of constant sirens so they can hear themselves think. 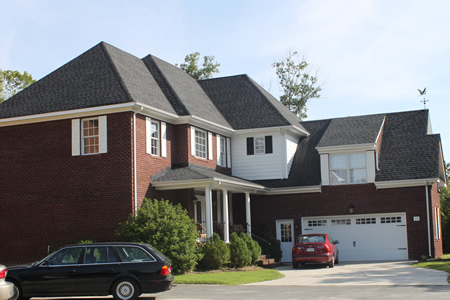 A custom home builder can walk property owners through every step of the construction phase. Choosing designs, floor plans and details of a house is all part of building a new home. Selecting a lot in Middle Oaks Estates provides the perfect backdrop for a new home doubling as a showpiece. Each of the five home sites here range in size from around 16,000 to more than 43,000 square feet. With that much space, a large estate home can certainly be accommodated. When working with a custom home builder, planning can be the fun part. Brick or stucco? Wainscoting or chair rail? Gas stove or electric? Georgian architecture or something more modern? The owner holds all the cards. Building a new home in Middle Oaks Estates is like building a whole new life here in Chesapeake. This area of Virginia is constantly changing and growing to meet the needs of its ever expanding population. One of the best perks of living in this new home community is the close proximity to golf courses. Grab those clubs and head over to Cahoon Plantation or Chesapeake Golf Club for a challenging round. Shops, churches, entertainment and schools are close by when it’s time to get out and about. Indulge those senses in a new home at Middle Oaks Estates. The only way to get exactly what you want is to start from the ground up and work with a custom home builder. Ensure the whole family will like where you’ve decided to begin building a new home. Take them through a tour of this Chesapeake enclave, then tell them the good news. Builders: Designs of Distinction, Summit Construction Corp. Send me more information about the Middle Oaks Estates new home community. Our agents gladly offer FREE property tours of Middle Oaks Estates, Chesapeake and homebuyer consultations to all serious buyers.